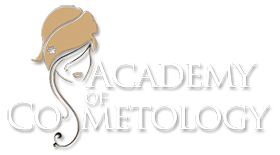 Thank you for your interest in the Academy of Cosmetology. The Academy celebrates it's 41st year in achieving excellence! At the Academy we offer the highest standard of education in the industry. The entire staff is committed to each and every student. Students will receive the most current theory and practical training available. We believe in keeping up with the latest trends and techniques, that is why we are constantly adding to our curriculum. The Academy is proud to recieve our Consumer Choice Awards for Business Excellence for many years now.